This game… This game…!! It’s both fun and infuriating. It’s great and terrible. 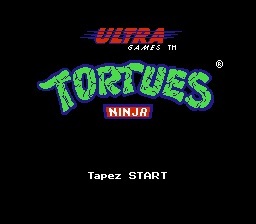 It’s… Well, one of the better TMNT games. The game controls alright, although there are certain annoyances, but it mostly has to do with level design. Some screens are just… bizarrely thought out. 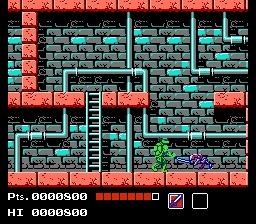 There’s one screen where you need to make a jump from a ledge onto the ledge of the other and if you fail, you fall all the way to the beginning of the screen. If that doesn’t sound too bad, consider this: You have to be pixel perfect and there might be some momentum added in there in order to make the jump; and even if it looks like you made it, beware of sinking through the ledge and into the floor below. This game is hard, and unjustifiably so. But you get to play as any turtle you want to play as, so it’s all good. Each turtle has his own life meter, so a good strategy is to switch a turtle out whenever your current one is in danger of getting defeated. The sound for this game is your standard NES forgettable stuff. There’s not going to be a single soundtrack in this game you’ll end up remembering, I think. The graphics for this game are… well… Let’s give the artists the benefit of the doubt and say this was the best they could do with the NES. I mean, they don’t look awful, but they don’t look all that great either. I guess they’re fine since you can tell what a lot of things are, although it kinda gets inexcusable when you start sinking through ledges. The story is… Aw, I don’t really know. April is kidnapped or something? Shredder is trying to destroy New York? I don’t know. It doesn’t matter. It’s all an excuse to play as the TMNT. This game is for fans of platform-action games. It’s for people who are looking for a challenge. It’s hard. Very hard. Maybe it wouldn’t be so hard if it didn’t have some of the stupid design errors, such as sinking through ledges, but there you have it. A fan of TMNT will no doubt enjoy this, but unless they have some top skills and the patience of Buddha, very few may stay playing. 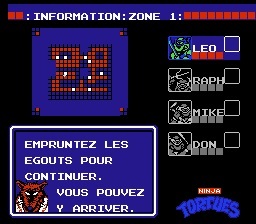 This is a complete French translation of Teenage Mutant Ninja Turtles for the Nintendo Entertainment System.